An inflight electronics ban throws up more questions than answers for Middle East airlines, and how do you handle slipper rage? An inflight electronics ban throws up more questions than answers. Will it really make a difference? And how do you handle slipper rage? 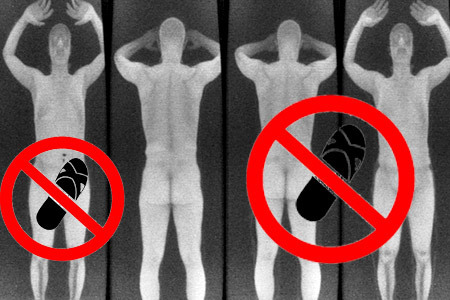 While your body gets a picture-perfect scan for smuggled electronic items, will slippers be next? AS ROYAL Jordanian’s surprise tweet about a cabin ban on electronic items on flights to the US from 21 March 2017 sank in, travellers and airlines scrambled to assess the impact of the action messily and mysteriously orchestrated by the Trump administration, eventually encompassing up to a dozen airlines from eight largely Muslim Middle Eastern countries. Britain responded in kind with restrictions imposed on six countries – Jordan, Egypt, Tunisia, Turkey, Lebanon, and Saudi Arabia – affecting in all, 15 airlines. US airlines have not been affected by the restrictions. While the US ban also covers Dubai, Doha, and Abu Dhabi – along with their popular powerhouse airlines, Emirates, Qatar Airways, and Etihad Airways – Britain remained reluctant to include these three airlines much favoured by value-seeking Britons headed on holidays to Southeast Asia and Australia. Indeed, their inclusion could spell economic disaster for the three national carriers, frequently criticised by less competitive US players for being coddled by state subsidies. There is rarely any mention of the hugely elevated level of service provided by these airlines, which of course, is a major traffic driver. Banning electronic devices larger than a mobile phone (roughly 16cm x 9.3cm x 1.5cm) paints affected airlines as less child and business friendly, as laptops and iPads (packed with spreadsheets, movies or entertainment) are removed from the inflight menu. Royal Jordanian put it thus: “Following instructions from the concerned US departments, we kindly inform our dearest passengers departing to and arriving from the United States that carrying any electronic or electrical device on board the flight cabins is strictly prohibited… Prohibited devices, including… laptops, tablets, cameras, DVD players and electronic games… can be carried in the checked baggage only.” The airline stressed that medical and life-support equipment was not included in the ban. This action immediately throws up a few questions. Are malicious electronic devices any safer in the cargo hold than in the passenger cabin? And are these devices the sole culprits? Bombs of varying sophistication are suspected in the case of the Russian Metrojet downing over Egypt (October 2015, supposedly with a device in an aerated drink can), and the Somalian airline that was hit by an apparent laptop explosive (February 2016). Going farther back, there was Pan Am 103 (blown up over Lockerbie, Scotland, December 1988), and Air-India 182 (brought down over the Atlantic, June 1985). Worryingly, two egregious failed bombing attempts that caught the public eye involved US airlines and, in both cases, the would-be attackers boarded their flights in Europe, not in the allegedly murky mayhem of the Middle East, as US authorities would have us believe. In December 2001, the ‘shoe bomber’ Richard Reid was on an American Airlines flight to Miami that he boarded in Paris. Later, in December 2009, the ‘underwear bomber’ was on a Northwest flight to Detroit that he boarded in Amsterdam. This brings us to the security of the baggage hold where all these apparently dangerous items are to be stowed. Clearly, an inflight explosion in the cabin, or in the hold, would be equally disastrous at 30,000ft. Yet, there is a modest difference, as detonating stuff in the cargo compartment requires a bit more sophistication and ingenuity as timers need to accommodate a range of variables like unforeseen flight delays and changes in barometric pressure, any of which could undo a terrorist operation. In a cabin, all you need do is flick a switch at an opportune point. This is the slender deterrence on offer. While details for the ban are still emerging – suspected al-Qaeda interest in battery compartments is one recurring theme – the decision was not clearly articulated or professionally disseminated with speed, throwing thousands of passengers into confusion about connecting flights, possible exemptions, and refunds. Authorities and airlines will gamble that in the long term, while passengers are inconvenienced, a more compelling realisation will dawn that it is a lot more inconvenient to have your flight rudely terminated aloft by some misguided teen with raging hormones, rampant imagination, and feeble wit. But is this the case? The jury will be out until a proper defence of the inflight electronics ban is mounted, citing specific threats as well as illuminating travellers about the differences in screening procedures for American airlines and Middle Eastern carriers. Are some airline checks more rigorous than others? Shouldn’t these be uniform? And who pays for all this? (Tickets for flights from the US are subject to a US$5.60 ‘Passenger Fee’ levied by the Transport Security Administration.) Importantly, will travel insurance companies be prepared to cover pricey laptops and cameras that may be stolen or damaged in transit? Israeli airline El Al spends a vast amount on security – other airlines do so to a lesser extent, usually while conforming to US screening directives. Yet, despite the cost, much of which is passed on to travellers, passengers are prepared to pay a premium for El Al’s ‘secure’ brand. Interestingly, El Al’s focus is not on the hardware but the software; not the phones, but the people; not the incendiary device but the intent. It is a subtle difference that airports would be wise to emulate. Often the who is more important than the what. Finally, there is no pre-empting strikes, like the one launched by an irate Indian member of parliament on an Air India flight from Pune to Delhi. He smacked a cabin steward repeatedly with his slippers after being informed he could not be upgraded to business class as the flight was all-economy. Police have charged him with ‘culpable homicide’ and ‘causing dishonour’. In a rare act of solidarity, all Indian airlines banned him from their flights. The government later relented and lifted the ban. Meanwhile, batteries in laptops are coming in for increased scrutiny.